Found her on the 1910 Justice Precinct 1, Wise, Texas census (dist 245 img 4) age 39. This is her second marriage. Her will was drawn 15 Mar 1872 and probate 7 Oct 1878. Cause of death listed as advanced age. Found him on the 1850 Vernon, Clinton, Ohio census (img 1), age 6. Found him on the 1860 Vernon, Clinton, Ohio census (img 6), age 17. Found him on the 1880 LeGrand, Marshall, Iowa census (dist 283 img 23) age 37, living with his brother Alexander. Found her on the 1900 Franklin, Warren, Ohio census (img 16) as Ruth Austin age 3. Found her on the 1930 Saint Bernard, Hamilton, Ohio census (dist 355 img 61) as Ruth A. Austin age 33, single. She is living with her widowed father Alpheus B. Austin age 67. Found him on the 1930 Hudson, Columbia, New York census (dist 29 img 5) as Raymond Belknap age 19. Address: 427 State St.
Found her on the 1900 Newton, Catawba, North Carolina census (dist 46 img 18) as Shy L. age 2. Found her on the 1910 Newton, Catawba, North Carolina census (dist 30 img 22) as Erlay Cline age 12. Found her on the 1920 Newton, Catawba, North Carolina census (dist 44 img 38) as Floy Cline age 22. Found her on the 1920 Civil District 3, Loudon, Tennessee census (dist 151 img 6) as Burl G. Cochrane age 22, single, living at home. School teacher, public school. Found her on the 1860 Clermont, Columbia, New York census (img 13) as Margaret Fingar age 51. Franklin H. Fingar aged 74, a lifelong resident of Germantown, died yesterday morning at the home of his daughter, Mrs. Fred Stickles, of Livingston, after a short illness. He was a retired farmer. Parents of the deceased were Horace Fingar and Albertine Weaver. Survivors, in addition to his daughter, Mrs. Stickle, are a son, Lloyd, of Clermont; grandson Bernard Stickles; a brother, Henry Fingar of Germantown, and a sister Mrs. Annie Rockefeller, of Germantown. Funeral servlces will be held Sunday afternoon at 2 o'clock at the home of Mrs. Stickles. Rev. Andrew A. Burkhardt of the Linlithgo Memorial church at Livingston, will officiate. Interment will follow in the Reformed Cemetery at Germantown. Found him on the 1880 Germantown, Columbia, New York census (dist 11 img 17) age 12, living with his grandparents Thomas and Julia Finger. However, he is also listed on the 1880 Clermont, Columbia, New York census (dist 8 img 7) as Franklin Fingar age 13, living with his parents and siblings. His wife is living with their children at the home of her parents and he is living with his mother. - 1900 Clermont, Columbia, New York census (dist 10 img 3). However he is listed as head of household with his family on the 1910 census, age 41, with his wife and children and 4 servants. - 1910 Clermont, Columbia, New York census (dist 9 img 3). Found him on the 1930 Clermont, Columbia, New York census (dist 12 img 7) as Frank Fingar age 61, farmer, fruit farm. His death record indicates he was the owner of an automobile service station. Found him on the 1900 Gallatin, Columbia, New York census (dist 12 img 3) as Percy L. Fingar age 6, born March 1894. Found him on the 1920 Hudson, Columbia, New York census (dist 33 img 25) as Percy L. Fingar age 26, chauffeur, private family. Found him on the 1930 Canaan, Columbia, New York census (dist 3 img 6) as Percy Fingar, age 37, manager, public garage. He is listed as son-in-law in the household of William Bither age 70. Found her on the 1850 (not stated) Catawba, North Carolina census (img 38) as Anna Ikard, age 38. Found her on the 1860 (not stated) Catawba, North Carolina census (img 65) as Ann Ikerd age 48. Obviously a male, but the extracted christening record, LDS IGI page 17,497 shows a female named Abrine. Found a Bryan Finger on the 1850 Saugerties, Ulster, New York census, page 28, age 19, clerk, living with James and Anna Woodruff. Also a male person age 22, with the last name Houghtailing - photocopy on file. Found him on the 1860 Saugerties, Ulster, New York census (img 122) as Brian Finger age 29, married, living at home, farmer. 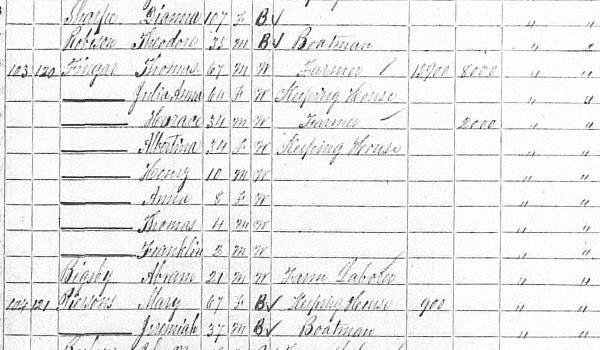 Found him on the 1880 Saugerties, Ulster, New York census (img 19) as Brian Finger age 49, Lumber & Coal. Found him on the 1930 Waynesville, DeWitt, Illinois census (dist 21 img 2) as Danial R. Finger age 5 months. Found him on the 1900 Justice Precinct 5, Brazoria, Texas census (dist 5 img 35) as Henry C. Finger age 6. Found him on the 1910 Justice Precinct 5, Brazoria, Texas census (dist 11 img 18) as Cecil Finger age 16. Found him on the 1920 Justice Precinct 3, Brazoria, Texas census (dist 4 img 6) age 26, single, living at home. Found him on the1930 Precinct 3, Brazoria, Texas census (dist 10 img 12) as Cecil H. Finger age 36. Found him on the 1920 Lincolnton, Lincoln, North Carolina census (dist 106 img 15) age 2 years 2 months. Found him on the 1930 Lincolnton, Lincoln, North Carolina census (dist 15 img 19) as J. Burgain Finger age 11. Father: Frederick Eli FINGER Jr.
Found him on the 1850 Division 3, Tippah, Mississippi census (img 62) as John M. Finger age 37. Found him on the 1860 Northern Division, Tippah, Mississippi census (img 121) as John Finger age 48, farmer. Found him on the 1870 Township 3, Range 2, Tippah, Mississippi census (img 14) as J. M. Finger age 57, miller. Found him on the 1860 Northern Division, Tippah, Mississippi census (img 121) as M. L. Finger age 1. Found him on the 1870 Township 3, Range 2, Tippah, Mississippi census (img 14) as M. L. Finger age 11. Found him on the 1900 Ripley, Tippah, Mississippi census (dist 105 img 1) as Luther Finger age 41, merchant. His widowed mother Cerena A. Finger age 78 is living with his family. Found him on the 1910 Ripley, Tippah, Mississippi census (dist 97 img 13) as Martin L. Finger age 50, retail merchant, dry goods. Found him on the 1920 Ripley, Tippah, Mississippi census (dist 62 img 4) as M. Luther Finger age 61, retail merchant, dry goods. Found him on the 1930 Ripley, Tippah, Mississippi census (dist 4 img 12) as Luther Finger age 72, merchant. Found him on the 1860 Buffalo Ward 7, Erie, New York census (img 25) as Michael Fingel age 5. Found him on the 1870 Buffalo Ward 7, Erie, New York census (img 36) as Michael Finger age 15. Found him on the 1880 Buffalo, Erie, New York census (dist 147 img 26) as Michael Finger age 24, painter. Found him on the 1900 Buffalo Ward 18, Erie, New York census (dist 142 img 10) as Michael Finger age 33, painter, car. Found him on the 1910 Buffalo Ward 12, Erie, New York census (dist 117 img 9) as Michael Finger age 55. Painting, car shop. He and his wife Elisabeth are living with their daughter and son-in-law George and Harriet Meister. Found him on the 1920 Benton, Yates, New York census (dist 174 img 20) as Fred Havens age 9. Found him on the 1870 Charlotte City Ward 4, Mecklenburg, North Carolina census (img 10) age 4. Found him on the 1880 South Point, Gaston, North Carolina census (dist 87 img 1) age 14. Birth date figured from death date, gr grandma Rowland's notebook lists his age at death as 35. Found him on the 1880 New Haven, New Haven, Connecticut census, age 5, first of 3 children. He is Survived by his wife, Bartha Buerman Lyle, one daughter, Mrs. Allen Borsh of Chatham, one slster Mrs. Milton Bryant of Ancramdale, one brother, Chester A. Sr., of Millerton, and three grandchildren. The funeral was held from the J. A. French funeral parlors in Chatham last Monday. The Rev. Frederick Musson, of the Gallatin Reformed church, officiated and burial was in the Gallatin Reformed church cemetery. Found him on the 1910 Gallatin, Columbia, New York census (dist 11 img 1) as Stanley B. Lyle ager 1. Found him on the 1920 Gallatin, Columbia, New York census (dist 16 img 9) as Stanley Lyle age 12. Found him on the 1930 Gallatin, Columbia, New York census (dist 14 img 5) as Stanley B. Lyle age 21, single, living at home. Laborer, general farm. Found him on the 1940 Gallatin, Columbia, New York census (dist 11-16 img 7) as Stanley Lyle age 32, laborer, farm. His widowed mother Cora Lyle age 64 is living in his household. On her son Oscar's death certificate she is listed as Laura Martin. Found her on the 1930 Jacobs Fork, Catawba, North Carolina census (dist 26 img 24) as Lora Bridges age 29. Found him on the 1860 Northern Division, Spartanburg, South Carolina census (img 15) as Ellis McMillin age 8 months. Found him on the 1870 Campobello, Spartanburg, South Carolina census (img 37) as Alice McMillan age 11, listed as a female. Penn Yan, Dec. 11 - Mrs. Cora Owen Werley, 72, of Farmington, Ontario County, died Sunday, Dec. 10 at Thompson Memorial Hospital, Canandaigua. She was born in Benton Yates county, the daughter of Charles O. and Emily Finger Owen. She leaves a daughter Mrs. Wilhelmina O'Meal, with whom she has made her home for some time past; a sister Mrs. Arthur Owen of Dresden; a brother, Milburn Owen of Athol Springs. Funeral services will be held Wednesday afternoon at 2:30 o'clock at Watkins Funeral Home, 13B Stark Ave. Rev. Walter A. Hanricks of Presbyterian Church, will officiate. Burial in Lakeview Cemetery. Found her on the 1880 Benton, Yates, New York census (dist 215 img 3) as Cora Owen age 8, At School. Found her on the 1900 Gorham, Ontario, New York census (dist 66 img 20) as Cora Werley age 28. Found her on the 1910 Benton, Yates, New York census (dist 173 img 4) as Cora Werly age 36. She and her daughter Wilhelmina Werly age 13 are living with her brother Wilkie C. Owen age 45. Found her on the 1930 Charlotte, Mecklenburg, North Carolina census (dist 27 img 44) as E. Dorothy Reid age 9. Found her on the 1920 Ivy Hill, Haywood, North Carolina census (dist76 img 16) as Ollie Rich age 3. Found him on the 1850 Cleveland Ward 2, Cuyahoga, Ohio census (img 8) age 35, cabinet maker. His father-in-law John Finger is living with his family. Found him on the 1860 Cleveland Ward 2, Cuyahoga, Ohio census (img 8) age 45, carpenter. His father-in-law John Finger is living with his family. Also in his household is Jacob Finger age 35. Possibly his wife's brother Jakob. Found him on the 1870 Cleveland Ward 1, Cuyahoga, Ohio census (img 96) age 55, sash factory. Also in his household is J. Finger age 46. Possibly his wife's brother Jakob. Found him on the 1900 Cleveland, Cuyahoga, Ohio census (dist 93 img 24) age 84. Immigrated to the U.S. in 1860. He and his wife are living with their son Jacob. DORMAN - At her home at 339 Ralph Elm Street, Penn Yan, July 10, 1947, Mrs. Ada E. Dorman 53. She leaves her husband, Frank of Penn Yan; two daughters, Mrs. Frank Spitz of Middlesex, and Mrs. Francis Davis of Rushville; a son Rodney Dorman of Rushville; nine grandchildren; three brothers, Ernest Tears of Benton; Charles Tears of Palmyra; George Tears of Penn Yan; four sisters, Mrs. Fred World; Mrs. Charles Klube, Mrs. Henry Christensen, and Mrs. Albert Kenwalfe, all of Penn Yan. Funeral services were held at the Middlesex Methodist church, Sunday at 2:30 p. m., Rev. Donald D. Cronk officiating. Burial in Nettle Valley cemetery. Found her on the 1900 Middlesex, Yates, New York census (dist 139 img 1) as Ada Tears age 6. Found her on the 1910 Benton, Yates, New York census (dist 173 img 4) as Ada A. Tears age 16. Found her on the 1920 Potter, Yates, New York census (dist 184 img 15) as Ada Dorman age 26.